As you can see here, the 'B4p' is the Classification as well as some more information. This text will be made up of 2 or more characters, these all have a purpose. The first character is the star class, this is 1 of 11 different letters, this letter denotes the color which is popularly also an indicator of the temperature of the star based on what we know of our universe. All star types are based on real star classes except for the green star, this does not exist in real life. with E being the Green star type and no known temperature. All of these different Star Classes can be put into 4 basic types, Yellow, Red, Green and Blue, this is what determines the warp drive needed to travel to them, this also determines the system specific resource. Yellow has no specific resource, Red has Rubeum, Green has Viridium and Blue has Cymatygen, while interesting to know about them, these 3 resources aren't needed for anything other than one for each of the Atlas Seed pre crafts. As for the Warp drives, you need Sigma to reach Red systems, Tau to reach Green systems and Theta to Reach Blue. There is more to know regarding the Colours, but we'll just finish off the other characters in the classification text on the galactic map first. The second character is a number, this is to further narrow down the temperature of the star, the lower the number, the hotter the star within its Classification. The potential third and more characters are letters that mean certain things within the system that mostly don't mean anything to you and your gameplay. Having an 'm' as the third or more character means "Enhanced Metal Features", this to me sounds like the planets are more likely to have higher frequency of metals on the surface or maybe more metal types per planet, or maybe it is just flavour text and means the sun is a little further along and is creating metallic elements. A 'p' in the class text means "Unspecified Peculiarity" and I am fairly certain this is related to those crazy planets you see, but it doesn't guarantee one at the least, after coming to this conclusion, I checked my home system which has a floaty metal glass planet and its classification is B1pf, this is by no means concrete and after checking a few systems with a p I found no ultra weird planets but I did find Airless, Abandoned and similar unusual planets, so I do think this is likely to refer to that. The rest I think may affect the general appearance, with some systems having that awful thick smog and such. Now as far as predicting the planets of a system before you've actually got there, it's a really simple thing that usually works, you essentially play the numbers. Planet biomes are also affected by the Star Class, you will find a higher frequency of certain biomes in certain Systems. Planetary biome frequency works on a probability system based on simple values. 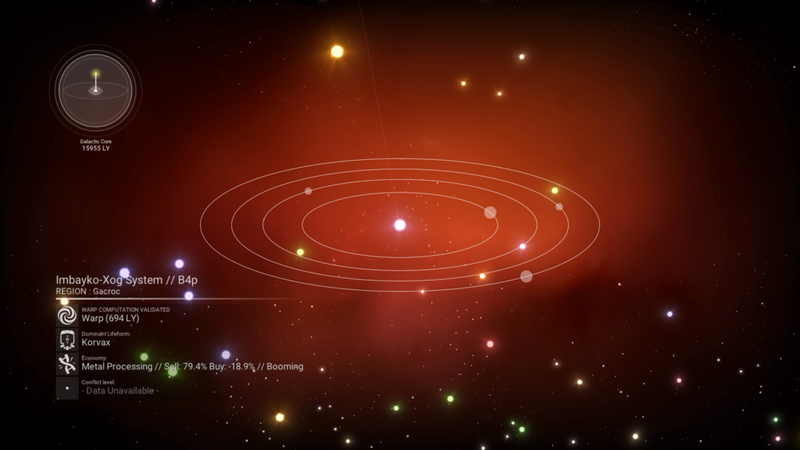 Yellow Systems have an average chance at containing Toxic, Scorched, Radio-Active, Frozen and Barren worlds with a double chance of having Lush or Dead planets. Green Systems have an average chance of containing Lush, Toxic, Scorched, Radio-Active, Frozen, Barren & Weird with a double chance of having Dead worlds. Red Systems have an average chance of containing Lush, Toxic, Radio-Active, Frozen & Barren planets with a double chance of containing Dead worlds and a triple chance of containing Weird planets. Blue Systems have an average chance of containing Lush, Toxic, Scorched, Radio-Active, Frozen & Barren Worlds with a double chance of containing Dead and Weird Planets. So if you are in the original Galaxy 'Euclid' then it's just those and if you want Weird planets, hit up the Red Systems, if you want Dead planets hit up the Green, for Lush stick to Yellow systems and for everything else both Yellow and Green have the same and best chances of hosting them. There are simple differences for the chance of life, based on system type but we'll cover that briefly after we've finished the planet types. For reference, the Original galaxy is classed as a Balanced galaxy, shown in-game as Imperfect, Parallel, Improved or Rebuilt and follows all of the previous rules and ratios mentioned above. Lush Yellow Systems have an average chance of containing Toxic, Scorched, Radio-Active, Frozen, Barren and Weird worlds, Weird or 'Exotic' worlds not being able to spawn in the default yellow star systems as well as a half chance or spawning Dead worlds and a huge 4 times chance of containing Lush worlds. This is the only modification to Lush Galaxies from the default. Then there are Vicious Galaxies, shown in-game as Raging, Ruthless, Relentless or Burning. For this galaxy type, the default mentioned previously is the same with an added frequency of Extreme planets, to what level of frequency is unknown. And finally, Abandoned Galaxies, shown in-game as Ancestral, Silent, Exhausted or Frozen. Abandoned Yellow Systems have an average chance of containing Lush, Toxic, Scorched, Radio-Active, Frozen, Barren and Weird Planets with a 4 times chance of finding Dead Planets. As well as this change to yellow systems, Abandoned Galaxies are also the only galaxy type that differs from the normal as far as the chances of finding life. The default chances of life are shown as a decimal, to what value this holds is unknown, it certainly is not a percentage as it just doesn't match up, but while we don't know the exact value, we do know how the different systems stack up against each other, if we consider the 0.1 value as average, then in all but the Abandoned Galaxies, Yellow, Green and Blue systems have an average chance of life with Red systems having a 5 times chance of life. With Abandoned Galaxies, you will find that Yellow and Blue systems have an average chance of life with Red having a double chance and Green having a 5 times chance. I feel as though this is to make green systems in an abandoned galaxy a sort of oasis among the stars. One of my all-time favourite screenshots from any game. Displayed is the Youtuber 'Khraze Gaming' on one of the best looking planets I have found so far in No Man's Sky, taken during our collaboration videos. I am unsure of the frequency of system spawns and how they differ between different galaxies, but if I were programming No Man's Sky, I would make those green systems an oasis, but make them very very rare, so that finding one meant a great deal and was worthy of settling. It is also worth noting that this is a base number or modifier, each biome would likely have its own rules for life chance among other things with these numbers being a modifier to mix things up. Meaning that a Lush planet in a red system in all but an abandoned galaxy will likely have far superior life to that of a Lush Biomed planet in another system type, though remember that there are now more than just 1 type of lush biome, with Paradise, Jungle and the like. To Help you along in your travels I have built a very simple little calculator that needs only one input; Your Galaxy Type, with that it will show you the systems you should go for to be able to find the planet type you want to find and of course always remember that picking the system color isn't everything, make sure to pick one with many planets and moons to give you the best chance of finding the one you want. This is a lot of information so I hope I have covered it in an easy-to-digest manner if there is anything at all you are not 100% about then please ask away in the comments, I always read every comment and I'm fairly good at the replying thing. If this guide was at all helpful then consider checking out my youtube channel where this and many other guides, livestreams and let's plays take place largely revolving around No Man's Sky. Maybe also consider checking out my Patreon, a dollar a month is a great way to support my work such as this and on top of that will give you early access to the videos on the Xaine's World youtube channel. But above all, have an awesome day folks!